If you have two choices, choose the harder. If you're trying to decide whether to go out running or sit home and watch TV, go running. Probably the reason this trick works so well is that when you have two choices and one is harder, the only reason you're even considering the other is laziness. You know in the back of your mind what's the right thing to do, and this trick merely forces you to acknowledge it. When I described the most basic way to implement security (membership) for ASP.NET Web Pages/Razor websites, I skipped over a feature that you can add to the registration page — namely, confirmation for registration. You're undoubtedly familiar with how this works. You register on a site, and they say "Go check your email!" You get an email from them that requests that you click a link in order to finish the registration process. You do that, and then — but only then — you are allowed to log in. This two-step process has a couple of benefits. One is that it helps to make sure that whoever is registering is actually a human and not a bot. In a sense, I suppose, it also helps make sure that people who register really want to register, since they need to go to some extra trouble. It also prevents people from registering multiple identities, since their user name is their (real) email name. In the registration page, you create the member account like normal by calling WebSecurity.CreateUserAndAccount, but you pass true for the requireConfirmationToken parameter. The method creates the membership account and also returns a token to you. The token is a value (it might look like LR9888HmlCEkiL3/GdUY5g==) that uniquely identifies the new membership account. In the database record for the membership account, there's an IsConfirmed field that will be set to false. Because of this, the user cannot log in yet. You construct and and send a "thanks for joining" email message. The body includes a link whose query string includes the token. The user clicks the link. This goes to a confirmation page in your site. In the confirmation page, you extract the token from the request. You then call the WebSecurity.ConfirmAccount method and pass the token. If all goes well, the IsConfirmed field in the membership database is set to True, and the user can then log on. SMTP port number. The most common value is 25, but hosters or other email providers sometimes use alternative ports like 587. SSL setting. This determines whether the server requires a security. User name and password. If the SMTP server requires authentication, you need to be able to provide the credentials for sending email. I wish I could be more specific about this, but the details vary depending on your situation. If you can't sort out what you need from this, contact tech support for whoever is hosting your site and ask them. // This code should actually go into the _AppStart.cshtml file. "<p>Thank you for signing up with us! " + "Please confirm your registration by clicking the following link:</p>"
+ "<p>" + confirmationLink + "</p>"
+ "<p>In case you need it, here's the confirmation code:<strong> "
Next is the setup for email, which is done using the WebMail helper. This uses the values I listed earlier. (I obfuscated the ones I actually used.) In this example, I'm including the WebMail initialization code right here. It's much preferred, however, to put this initialization code into _AppStart.cshtml, right there next to the WebSecurity.InitializeDatabaseConnection call. You really only need to set these initialization properties once for the WebMail helper for your whole app, plus it makes it easier to change those values if you ever need to. 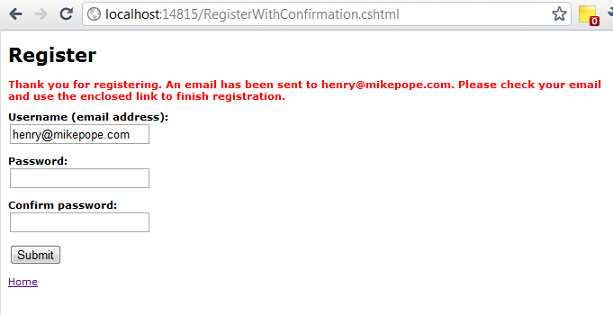 Finally, of course, you tell the user that you've sent them an email and that they have to finish the registration. The complete listing for the registration-with-confirmation page is here. (No nice formatting here, sorry about that.) You can actually use the same code to process what they submit. The complete listing for the confirmation page is here. That's about it. As you can see, it requires only a little bit of effort beyond what you've already seen for absolutely basic login security. If you're testing your site using your computer at home, you probably can use your normal email provider (e.g., smtp.comcast.net or whatever). But don't do that for any production levels of email.